Disney already has their own money that’s 1:1 to USD, redeemable at at Disney joint in USA. I can’t believe Hello Kitty has it! You do know about Hello Kitty credit cards, right? I have one and it is just great! I love using it, plus it has a good interest rate! By the way, Hello Kitty Hell guy, you seem to be getting more and more pissed off. It seems like it has gone beyond funny and now you are seriously mad about all this Hello Kitty stuff! It will be okay. Eventually your wife will get tired of her, right? Umm…maybe. But I hope you aren’t too mad. Hello Kitty rocks! hehe. I discovered your blog today because of that laptop you posted about two days ago (did your wife get you one? I have my fingers crossed for you, it’s truly a sick display) and have spent my entire afternoon reading your blog from the very beginning. I feel for you, man. I have a cute obsessed friend and the constant worry about upsetting her because I think Hello Kitty is lame… Living with it like you do, I have no idea how you get through the day. You’re either a saint or a masochist. Or both. What ever happened to the Hello Kitty figurine, by the way? somehow your frustration with your wife’s interest in hello kitty is highly amusing. i hope you don’t feel that bad about hello kitty. she’s adorable. hahaha. but i guess i can understand you. how old is ur wife? i work at a bank, and you see tons (mostly on higher value bills, though). they’re not really so cute when you know where they’re coming from. Man, this is really funny. Well you won’t believe this but I’ll tell you where this bill probably comes from (or was in): Colombia! All the currency exchange places have a stamp that they use on all the bills that they hand out so that if someone claims that it is fake they can trace it back. 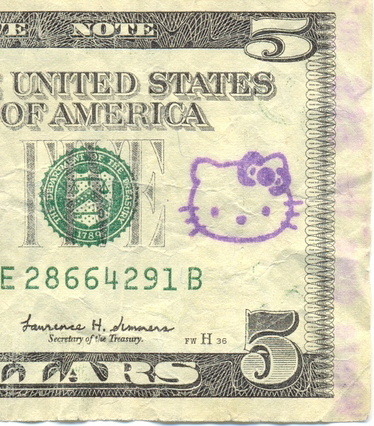 Apparently this specific exchange place is using a Hello Kitty stamp… hmmm! Holy cow! I never thought I’d see that ever again. When I first saw it in my money box, I thought I was seeing things. I wanted to trade it that day but didn’t have a dollar on me. Dammit! Awesome seeing it here again. how do ahh make this stuff? I am a big fan of hellokitty, that is why i want to know how ahh make this all hellokitty stuff! I would totally use that. I find alot of the comments made by Hello kitty fans disturbing. “In hello kitty we trust”? My personal favourite the comment on how body scarification in the shape of the kitty is showing “devotion”. Devotion to what exactly? What is wrong with these people? It’s a two dimensional cartoon character designed for the amusement of infants. The cat is just a corporate symbol! Do not idolise it, accept it as only the visual representation of an idealised fantasy world created to simplify morality and good behaviour. It’s nice, it’s cute, but it’s not a prophet or a god and should not be treated with such reverence as has been displayed by some. It seems to be becoming a religion. These people need to stop idolizing HK, it’s not healthy and it’s insane! ‘In Hello Kitty We Trust’ is the worst idea ever! You CAN’T replace GOD with a freakin’ CARTOON CHARACTER!!!!!!!!!! Dude, I’ve seen that before 0_o I had one on mah dollar!! I want a “Hello Kitty mony” it is cute! HELLO KITTY RULES THE WORLD! I found a $5 bill just like that before. I might have to compare the numbers, because I still have it, and it might be that exact one.